One important feature of the standard model is its portrayal of the West as a regrettably late intervener in the Rwanda struggle, with oft-cited ex-post apologies from Bill Clinton and Madeleine Albright during their visits to Rwanda in 1997 and 1998 for U.S. and allied failure to intervene to prevent the massive killings in 1994. Philpot traces U.S. support of Kagame and the RPF back to the October 1990 invasion of Rwanda from Uganda and even earlier. Kagame had trained at Ft. Leavenworth and the United States and its allies were already supplying Uganda with arms, training, and diplomatic support in 1990. The invasion and occupation of Northern Rwanda by this foreign-based force, which started on October 1, 1990, resulted in the forced exodus of hundreds of thousands of Hutu farmers. Although this was a violation of the UN Charter, as well as a major human rights disaster, it led to no condemnation or action by the UN or “international community.” In fact, in succeeding years the United States and its allies supported the penetration of the RPF into the political and military structures of Rwanda, essentially pushing a major subversive force into the institutions of a victim of aggression. The Rwanda government was also forced by the IMF and World Bank, along with the United States and its allies, to abandon its social democratic policies, disabling it as a force helping ordinary citizens, including both the many refugees dislodged by the RPF and the large numbers streaming into Rwanda from Burundi where a Tutsi-military coup d’etat and murder of its Hutu president in October 1993 had led to a flight similar to that produced by Kagame and the RPF within Rwanda itself. Philpot cites evidence that as early as 1990 the RPF organized covert cells throughout the country, surely deisgned for future action in a plan to seize control of the state. Tutsis comprised at most 15 percent of the population and, given their historic role as a ruling superior class—defeated in a 1959 social revolution with many fleeing to Uganda—and their role via the RPF in ethnic cleansing and refugee creation from 1990 onward, there was no chance that they could take power in a free election. Philpot makes a compelling case that they knew this quite well and were planning a violent takeover, which did in fact occur. Philpot stresses that from October 1, 1990 onward and through the mass killings years of 1994-1995, Rwanda suffered a de facto war, carried out by the RPF, with Ugandan help, and, more crucially, with the assistance of the United States and its close allies. This also meant the automatic help of the subservient UN. In the standard model there was no war—the 1990 invasion and its consequences are kept out of sight and so is the steady infiltration and major-war preparations of the RPF up to the onset of a full-scale war and mass killings in April 1994 and onward. The large-scale slaughter in Rwanda began immediately after the shooting down of a plane carrying Rwanda President Juvenal Habyarimana and Burundi president Cyprien Ntaryamina at the Kigali airport on April 6, 1994. This was widely recognized as the “triggering event” in the mass killings and “genocide.” In the standard model, the deaths of Habyarimana and Ntaryamina were either organized by Hutu government officials or were inexplicable. However, there is overwhelming evidence that these deaths were organized by Paul Kagame and the RPF, very possibly with the help of their Western supporters. The International Criminal Tribunal for Rwanda (ICTR) looked into this issue in 1996 and 1997, with their principal investigator Michael Hourigan eventually charging the crime to Kagame and the RPF. French and Spanish investigators came up with the same result. But when Hourigan presented his report to ICTR prosecutor Louise Arbour, after consulting with U.S. officials Arbour closed down the investigation and it has not been taken up since by the ICTR or any other international organization despite the importance of this event to the terrible and much publicized devastation that ensued. This episode of suppression and refusal to investigate is telling at several levels. For one thing, it shows the dominance of the United States in ICTR decision-making and Arbour was in fact vetted by Madeleine Albright before her appointment as prosecutor (also for the ICTY). It also displays Louise Arbour’s subservience to the global monarch and non-judicial behavior, for which she was further rewarded with a high Canadian judicial appointment, then as Kofi Annan’s choice as UN High Commissioner for Human Rights, and then in 2009 a presidency of the supposedly non-partisan NGO the International Crisis Group. Philpot calls the RPF’s military triumph a coup d’etat, and the case he makes for this is convincing. The coup d’etat was the final result of a war—first an open war begun October 1, 1990, then with a three-year mainly low level war of RPF subversion and buildup of military cadres, partly hidden, with cells of subversive agents awaiting the coup moment, then the assassinations and conquest. The war was greatly facilitated by Western insistence that the Rwanda government make a place in the army and Administration for RPF representatives—done in the Arusha Peace Accords of 1993—and to force that government to carry out “reforms” and “austerity” policies that weakened its hold on its own population base. 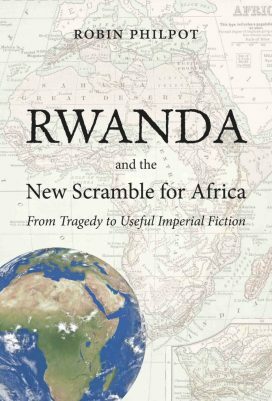 In the buildup toward the final conquest and takeover, the low-level RPF war was also greatly helped by the West’s putting the Rwandagovernment under siege for its alleged human rights violations. The government did arrest some 8,000 individuals suspected of being RPF agents or active supporters in October 1990, all of them released within six months. This caused a frenzy in the Western political establishment, media and among human rights groups. Although the RPF (and Uganda) had invaded Rwanda, produced hundreds of thousands of refugees, and posed an enormous security threat to Rwanda, this was all overlooked by Western propagandists. Their sole focus was on the Rwanda government’s alleged excesses. Philpot notes that the many thousands of Japanese imprisoned by the United States and Canada during World War II involved a trivial security threat in comparison with that posed by the RPF against Rwanda. But the United States and its close allies supported the RPF, hence the huge bias throughout the West. Philpot emphasizes the important role played by human rights NGOs in demonizing the Rwanda government and advancing the RPF’s war program. None existed in Rwanda before 1990, but they multiplied thereafter, almost all favoring the RPF. Most notable was the International Commission of Inquiry on Human Rights Violations in Rwanda, which issued a report in 1993 that harshly condemned the Rwanda government and said virtually nothing about RPF abuses. The Commission had spent two weeks in Rwanda, including only two hours in RPF-controlled territory where nobody was interviewed except in the presence of RPF personnel. The Commission’s financing and personnel assured its RPF supportive conclusions, and the RPF openly waited for the report before launching fresh military attacks that resulted in thousands of civilian casualties. The Commission ignored the crime of aggression, focusing only on alleged war crimes in the ongoing low-level war. Its policy stance here, like that of Human Rights Watch and Amnesty International in the Iraq invasion/occupation, was that condemnations of acts of aggression are outside of its sphere of interest—it focuses only on any ensuing war crimes committed by the aggressor or his victim. This flies in the face of the UN Charter, but is wonderfully convenient to the United States as the world’s towering leader in the field of aggression, and fitted nicely the needs of Kagame and the RPF in their aggression against, and conquest, of Rwanda. The Commission’s report was cited widely as authoritative and its extremely biased authors—several of whom became officials in the post-conquest RPF government of Rwanda—became favored experts in the media and served as prosecution witnesses in cases brought against the Hutu losers (and only Kagame-RPF approved losers have been tried by the ICTR). Philpot has detailed the crushing accounts of the ignorance and conflicts of interest of Commission members and other Western publicists and propagandists for the RPF cause, most notably Alison Des Forges (a consultant to the U.S. State Department and Pentagon); Philip Gourevitch (at that time brother-in-law of Jamie Rubin, Madeleine Albright’s PR person, with full and uncontested access to the liberal New Yorker); Canadian analyst Carol Off (whose heroine was Louise Arbour), Gil Courtemanche (a Canadian novelist); and Belgian journalist Colette Braeckman (author of a classic RPF apologia in 1994; the authority in the Belgian Le Soir and the French “left” Le Monde Diplomatique). With their help and a heavy flow of government disinformation, the standard model was institutionalized. In the standard model, the Hutus were the villains who tried to exterminate the Tutsis and carried out a “genocide.” But it is certain that many more Hutus than Tutsis were killed; the RPF was a well-organized army, supplied and protected by the United States and its close allies, and ready for action on April 6, 1994, whereas the government’s leadership was taken by surprise, disorganized, short on arms, and defeated within 100 days. (For a discussion of the numbers, Herman and Peterson, The Politics of Genocide, 56-61.) But with unconstrained support of the U.S., UK, Belgium and Canada, a miracle of propaganda was achieved in making the aggressor and coup regime and its killing machine into a savior of the Tutsis from the Hutu victim population. The propaganda system has done this job so well that Kagame can make any opposition into supporters of “genocide.” The ICTR helps by steadily pursuing alleged genocidaires (and specific Kagame targets) and Kagame can win elections with 90 plus percent of the vote, without his ceasing to be a Western hero (an African “Abe Lincoln” in the view of Gourevitch). No more misleading and erroneous use of the word genocide can be found anywhere. Most important, pursuing those genocidaires into the Democratic Republic of the Congo (DRC) has been Kagame’s excuse for invasions and mass murder there since 1996. He and Museveni have killed several million Hutu refugees and locals in the Eastern DRC, in a killing continuity with that in Rwanda. Although the numbers killed in the DRC far exceed the deaths in Rwanda, this is not described as a “genocide,” no Tribunals are established here, and no ICC indictments deal with these big-time criminals (Kagame and Museveni). The imperialist perspective is blatant, and in fact both Boutros-Ghali and Mobutu were removed in short order and Museveni (along with Kagame) has prospered and for many years could occupy the DRC and kill with impunity The interview with Kornblum took place just as Kagame was bombing the refugee camps and beginning his murderous march, fronted by Laurent-Desire Kabila, to overthrow Mobutu and take Kinshasa and the entire DRC. And as in Rwanda itself, with the aid of people like Romeo Dallaire, French initiatives for refugee succor in the DRC were squelched (and we are talking about a million-plus refugee population in distress). Philpot has a telling story of how the United States, here again with Canadian help, aided Kagame in clearing out Hutu refugee camps in the DRC by violence, all of these allies helping push the refugees toward Rwanda or into the DRC forests, bombing and shelling the camps, and killing vast numbers. With the aid of its Canadian puppet, the United States succeeded in fending off a threat that the UN would increase its protective forces in the refugee camps, closely analogous to the successful U.S, effort to reduce UNAMIR forces in Rwanda as the RPF slaughters there escalated. Philpot’s book tells a grim story of geopolitical interests of the United States and its close allies, causing them to intervene heavily in Rwanda and the DRC, supporting killer regimes that overthrew a relatively responsive and representative government in Rwanda with a ruthless minority regime and dictatorship, but responsive to U.S.-UK interests (Kagame was the only African leader to welcome the U.S. invasion of Iraq). The Rwanda and Uganda regimes were adjuncts smoothing the road for Western penetration of the DRC. The “collateral damage” of literally millions of African deaths was completely acceptable to U.S.-UK leaders. But the propaganda/disinformation flood was so great that perhaps they believed the standard model that they were bringing civilization and Western values to the benighted. In reality, as Philpot describes so well, they were bringing hunger, death, dictatorship, and chaos to African peoples. Edward S. Herman is an American economist and media analyst with a specialty in corporate and regulatory issues as well the media. He is Professor Emeritus of Finance at the Wharton School. He is perhaps best known for developing the propaganda model of media criticism with Noam Chomsky. It’s surprising to find no comments attached to your very insightful commentary. I’ve often had to slough through ignorant comments on Rwanda; posted by competing bigots, as justification for European and now Asian exploitation of Africans and their natural resources. Yet in the light of TRUTH, narry a peep.